This was such an entertaining story! I shouldn't have started reading it so late in the evening, because I didn't want to put it down to go to sleep (although I eventually did at my husband's pleading). 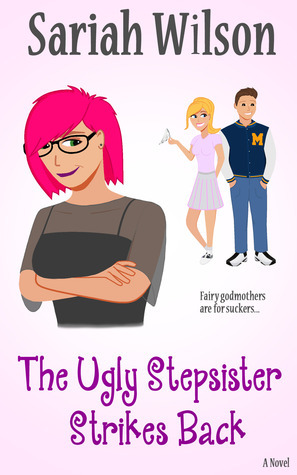 The Ugly Stepsister Strikes Back is a modern-day Cinderella story told from the stepsister's point of view. It is hilarious! I laughed so many times at everything from words like lustalicious and guyliner to the crazy situations Mattie put herself in. Even though there were a lot of laughs, there were also some deeper emotional parts where I really felt for Mattie. This is a book I can see myself reading several times. It's a fast, clean read with great characters, and I highly recommend it. I'm looking forward to more books from Sariah Wilson. Sariah Wilson has never jumped out of an airplane, never climbed Mt. Everest, and is not a former CIA operative. She has, however, been madly, passionately in love with her soulmate and is a fervent believer in happily ever afters—which is why she writes romance. The Ugly Stepsister Strikes Back is her fourth happily ever after novel. She grew up in southern California, graduated from Brigham Young University with a semi-useless degree in history, and is the oldest of nine (yes, nine) children. She currently lives with the aforementioned soulmate and their four children in Utah, along with three tiger barb fish, a cat named Tiger, and a recently departed hamster that is buried in the backyard (and has nothing at all to do with tigers). You can follow Sariah on her website, Facebook, and Twitter. *Thanks to Sariah for sending me an e-copy to review. Thanks so much for the review! :) I'm glad you liked it. Count Down to Love Winner!